GoPro Camera , The world’s best selling wearable HD cameras for sports. The first trend is already big, every smartphone has accelerometer, GPS. And with Bluetooth, WiFi or ANT+ is possible to extend the list of sensors. Some of these sensors or data input are heart rate monitors, blood pressure monitors, glucose meters, sleep monitors, gym equipment, scales. ANT+ can give an overview on some of the interconnected elements that are possible with this protocol. And these data are more and more shared in social networks, Facebook and Twitter, adding the social element. Gamification is now an essential element in any application or service to engage people, see previous blog post. The (Withings) WiFi scale transmits your weight automatically to the server. You can share your weight (and yes, people do it, see a Twitter Withings search). The social element pushes you to improve your wellness and gamification, with rewards, badges etc, is another lever for a more effective weight management and fun. Overall, this is the present and we should expect more and more of these kind of experiences in the near future. The use of game thinking and game mechanics to engage users and solve problems. This framework for understanding gamification is both powerful and flexible: it can readily be applied to any problem in need of a solution. Examples of game mechanics are the use of points, badges, levels, challenges and rewards. The idea is to apply concepts already widely used in games into websites and applications to drive loyalty and engagement. We are in the grip of gamification-mania. Rick Gibson of Games Investor Consulting says “Some analysts estimate that 50% of companies will have ‘gamified’ by 2015. That’s 13.5 million businesses in the U.S. alone. That seems pretty ambitious to me. Gamification is not a panacea. Many of the things that proponents claim gamification can do can be done by normal business processes: redesign your website, improve your product, train your customer service better. But if you are looking for ways to encourage behaviors amongst your customers, it has a place in the marketer’s arsenal. Reality is Broken explains the science behind why games are good for us–why they make us happier, more creative, more resilient, and better able to lead others in world-changing efforts. 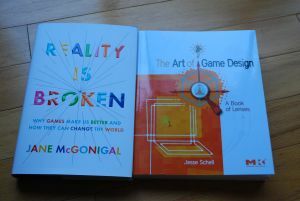 One authority in games and gamification is Jesse Schell, the author of The Art of Game Design. Bruce Sterling reviewed the book in Wired. I talked of Jesse Schell in this blog one year ago in the post Design Outside the Box. He gave a very good presentation on Gamification and it is worth sharing it again.